Who can forget the Eye of Sauron from the Lord of the Rings trilogy? That all-seeing eye has definitely invoked fear in many who have crossed paths with it through the palantir, and I myself would be scared to death of a disembodied eye, too, which so happens to be surrounded by fire and brimstone. Well, fast forward to today and we have something that is a whole lot more modern and looks far less menacing. In fact, it ranks pretty high up there on the coolness factor, and I am referring to the Zeiss VR One, which has been touted to be the ultimate 360-degree viewer. The Zeiss VR One glasses will be able to turn new 360° video trends into an experience that is difficult to forget! After all, YouTube is the platform that has long offered access to a sensational form of videos, and YouTube did roll out its 360-degree video function earlier this year, which would allow one to upload videos that show off all the surrounding area from every single possible perspective. The latest version of the YouTube app would bring the video experience on the YouTube portal to another level, as you can now download the latest version of the app allows users to pick a new function – the VR (virtual reality) mode. With VR mode on, you can watch 360-degree movies with the ZEISS VR ONE glasses, and walk yourself through a deceptively realistic environment. In other words, you will be able to also watch 360-degree videos on a PC, but the Zeiss VR One delivers a totally new visual video experience thanks to the special 3D effect that is created by the VR glasses, and cannot be experienced in the same way on a PC. 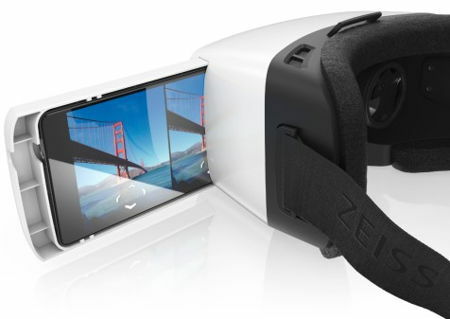 Using the Zeiss VR One is a snap, all that you need to do is to place a smartphone into a tray and slide it inside, and you’re good to go.